The Arsenal passed their test at the weekend, a Saturday stroll ensuring 3 points on the table to keep pace with those around them. Now at the business end of the season there are no more easy games, each match regardless of the opposition is a potential banana skin and it was important that the disappointment of the game against Bayern Munich in the week did not have a knock on effect to the players. I’ve had a day or two to digest the events of Saturday and thought I would share my thoughts and reflections with you this Monday morning. For a game that produced four goals for the Arsenal the atmosphere was quite subdued inside the Emirates. The weather was nice, an early goal was scored and I suppose the urgency within the match was quelled as soon as Olivier Giroud struck the opener. When you compare in contrast the electric atmosphere when Bayern Munich came to town it was like matching a 100 bpm Scooter track to anything sung by Norah Jones. In fairness there is hardly any bad history between Arsenal and Sunderland to spark the ire of the fans. Another reason for the atmosphere could be related to my next point. With the lack of intensity in the game on Saturday the team still managed to suffer on the injury front. It is hoped players were replaced as mere precautions rather than anything serious. Nacho Monreal was replaced at half time by Carl Jenkinson after receiving a kick on the foot in the first half; Laurent Koscielny then went off meaning Sagna had to cover in the center of defense with Matthieu Flamini covering at left back. Jack Wilshere was also struggling towards the end of the game meaning the backroom staff will be putting in some overtime this week to patch the players up ready for next week’s game at Stoke. The defensive injuries are the biggest worries as a Monreal injury would come at the worst time following Kieran Gibbs misfortune in the week. Vermealen is rumored to be returning to the side soon and he will be surely needed if any of the starting back four have any injuries longer term. It was a special day in the memory of Dennis Bergkamp’s legacy as a player for Arsenal. 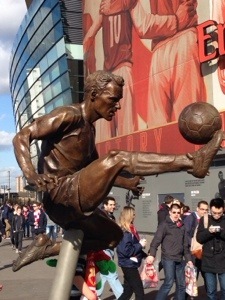 The non-flying Dutchman’s statue was unveiled on the morning of the match to a very appreciative crowd. It’s always great to see former greats return to the club and one of such standing as Bergkamp certainly brings back the good feelings of where Arsenal used to be and could one day be again. He was fully deserving of his statue and was humble enough to dedicate such an honor to his team mates and the support of his wife and family. For those who could not make it to the unveiling he made an appearance at half time to the Emirates crowd to great applause and adulation. Although the official reason was an injury to the German playmaker I am pretty sure Ozil was rested just to relieve some of the heat he endured in the past week. In fairness he has played a hell of a lot of football this season and the break could do him some good. Although he was rumored to be present at the Emirates on Saturday, Ozil still can benefit from having no football to affect him physically or mentally and start afresh next week. He still has the support of his team mates and the majority of fans despite what the tabloids say. It was nice to see the Italian return to the Emirates as a more respected goalkeeper. Mannone has certainly seized his opportunity upon leaving Arsenal and has made himself the first choice in the Sunderland team. He has proved himself to be the goalkeeper he had the potential to be whilst with Arsenal but failed to build upon. 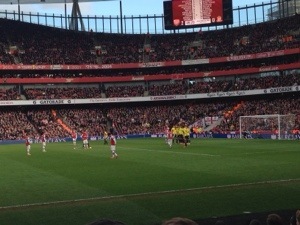 I’m sure Gunner’s fans will back the keeper 100% next week in the Carling Cup Final as he remains popular amongst them. Mannone’s career advancement has surely acted as inspiration for our very own Lukasz Fabianski to seek pastures new. He has likely glanced over at his former rival with envy and aimed to seek similar success to boost his club and country fortunes. Never thought an international break would be a welcome event but given the events of the weekend I feel us arsenal fans will appreciate the breather. Supporting arsenal is a full time job and the lows come part and parcel with the highs. The thing with football is it is an infinite journey with many twists and turns, there are no finish lines, you win a cup you move on to the next one. It isn’t like a rocky movie with a freeze frame of punching the air in glory at the end you plan for the next season and move on. Saturday’s draw felt like a defeat to many gunners’ fans, to throw away a two goal lead at home to a side not on our level hit hard, really hard the missed penalty rubbed salt straight into the open wound that was our patience. The bad feeling peaked on Saturday and it took a day or two for the fans to calm down. Would a midweek game have given the team a chance to fix the errors from Saturday? Probably, maybe but for me the mini break gives me a chance to recharge my faith and belief in my team. Provided there are no major injuries from the international games I can realign my focus on the massive game we have coming up. Last season the match against spurs was a major turning point in our fortunes as we overturned the bad feelings from previous games and restored the belief in the team. This season things are slightly different however the bad feelings are lingering. Losing to Tottenham is not acceptable at any time, and if that were to happen this Saturday then the Wenger out brigade will be at their strongest, a defeat would make any defence of Wenger a hard task. We do have some positives leading up to the north London derby. The form of Olivier Giroud is a positive, the Frenchman is starting to find the back of the net more regularly and the confidence is growing. We will need the big guy to bring his A game on Saturday, if there are still arsenal fans out there yet to be convinced about Giroud’s abilities then the winning goal against the spuds will elevate the striker to god like status (for a day or two). I for one feel a bit more confident he can cause some problems for the spud defence and hope he returns from France duties with no injury. Another positive is the return of Szczesny to the arsenal first team, I would assume he is a shoe in to start on Saturday replacing Vito Mannone, although the Italian hasn’t been a complete disaster in the first team he has raised a few questions in recent performances. The header he conceded on Saturday is one of the goals you would expect a top keeper to save, he will be a lot better for the experience he has gained over the last month or so but now is a time for reflection to work on the good and bad sides of his first team game experiences whilst our Pole returns to number one duty. In other news Emmanuel Frimpong went public to declare his determination to succeed at arsenal. Some rumours started to surface yesterday that the combative midfielder was going to be sold in the New Year as the club decided against offering him a new contract. Thanks to the platform of twitter the arsenal man put the rumours straight by stating he intends to stay at arsenal beyond this season, he also hinted that a loan move is on the cards. Which team that will be is not yet known but he clearly has been given the blessing of Arsene to continue his rehabilitation with first team football out on loan. He built such a good relationship with Wolverhampton wanderers last season it would not surprise many if he went back there on loan. The drop down to the championship may not carry favour with all fans but I feel the chance for first team will take preference over whether it’s at premiership level or not. It would probably be a greater test at championship level for him as the tackles are not wrapped in cotton wool there. Of course we don’t want to risk a reoccurrence of the injuries he sustained over the years but in the long run he needs to overcome the psychological barriers such injuries can bring. It helped benefit Aaron Ramsey’s return to arsenal first team duty with his spells at Cardiff and Nottingham Forest and can do the same for the Dench mastermind. A big fat slice of karma came flying the direction of Ricardo Vaz Te on Saturday afternoon. For those who saw the match on Saturday (I don’t think the incident that led to the premature removal of the Portuguese from the field of play was shown on match of the day) the cause was nothing more than the player deserved. As a through ball was played into the area Vito Mannone rushed from his line and won the ball in what was clearly the keepers ball; Vaz te even though he had every right to try to get the ball when it was clear it wasn’t his to win he still decided to leave his trailing leg in which connected with Vito Mannone’s head. Seriously given what happened a few years back to Petr Cech it is very concerning to know players still take these immoral measures. We all know what the potential repercussion can be and so I cannot understand why players feel the need to try such sneaky cowardly actions just to try to gain an advantage in a game of football. 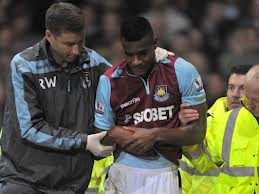 If Mannone came off seriously injured you know the first thing that would happen is the overwhelming defence of Vaz Te claiming he’s not that type of player. Well on Saturday he showed he is that type of player but given what happened immediately after his actions all will be forgotten as football fans all feel sorry for his unfortunate luck. Yes the next events proved that what goes around comes around; usually karma takes its sweet time to even things out but on Saturday it took rapid action and within seconds of his boot flying in Vaz Te was sprawled out on the Upton park sidelines in pure agony. It turns out the west ham player’s momentum carried him past the pitch and resulted in an awkward fall which produced a dislocated shoulder. Reports arose on Sunday that the player will be out for up to three months due to the injury. If the player had a time machine I am sure a different course of events would have happened in that instance. I must go on record that I do not dislike west ham, I have no problem with the club and do not wish ill on any of their players however I was incensed by the actions of Vaz Te at that moment in time and can on conclude he got what he deserved for that. May he return from that injury back to full health and a little wiser and more aware of his actions in future. I would not condone it if an arsenal player did the same. Away from the Vaz Te karma we now have to content with two weeks of no football. well, no premier league football; I find it hard to get excited for international football unless it’s the actual tournament. Qualifiers and friendlies do not fill any void; they are always full of controversies and injuries. Will be interesting to be a fly on the wall to see how Ashley Cole gets on in his first day of training, apart from that I better find another hobby for the interlull. The arsenal news over the next week ot so will probably be full of whether Theo signs a contract or not and I’m not even wasting my time researching our alleged £35m attempt to sign Falcao. I mean, seriously?